This menu is part of the page "Wild Hunt" on "www.AvalonsTreasury.com". The spectral hounds of Herne, speareheading the Wild Hunt, symbolize strength and energy. The Celtic craftsmen were known in the whole world for their symbols made of various materials. 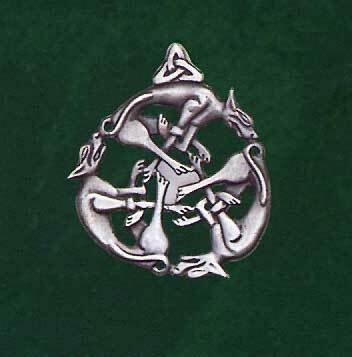 The high quality of these pendants excelled them among their contemporaries as being artful and knowing - hence, the uniqueness and the skillfull design of these symbolic pendants is unsurpassed until today: During the Wild Hunt the eerie spectral hounds, which are pictured on this pendant, are scuding over the night sky, followed by the mighty Herne. Herne was the dark God of Hunt from the underworld who in former times was worshipped as the God of the forest creatures. 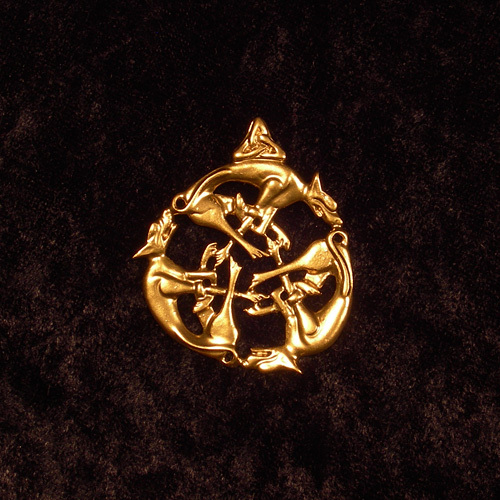 This pendant is said to help its wearer to gain energy and leadership skills. This pendant is made of pewter, a shiny, soft metal which is very malleable and has a good tarnish resistance. Artists and craftsmen used pewter quite early (dinnerware, sculptures, household articles, pewter figures, jewelry) and hence pewter jewelry has a long tradition. The word pewter is probably a variation of the word spelter, a colloquial name for the same metal. This jewelry can be manually coppered, silvered or gilded by our skilled gilder - this special service only costs the given surcharge. Please be aware that for this service an extra time of 3-5 working days is needed before shipping. Furthermore we also offer this piece of jewelry in partial coppering, partial silvering or partial gilding: For the given surcharge our gilder can ennoble parts of this jewelry you select and leave the rest untreated. For this service an extra time of 5-7 working days is needed - please state your requirements in the corresponding text box. Website: Our short information is "Online Shop for Minerals, Gems & Jewelry"
Page: This pendant, showing the Wild Hunt, can increase your energy and leadership skills.